Three of my hats were accepted into the 9th Annual NoHo Art Walk which is celebrated in the historic No(rth of)Ho(uston) community in New York City. There are over 200 works from established and emerging artists showcased in stores, restaurants, and banks in the area. Presented by the NOHO NY Business Improvement District in conjunction with New York City’s leading schools for the arts: Pratt Institute, Fashion Institute of Technology, New York University, and the New York Studio School. My hats are on view at the TD Bank on Broadway and Bond, the site of the opening reception. 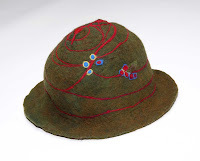 Check out my website www.patriciabronsteinart.net under FELT to see the hats: Cake, Green, and Sunset. It seems to have less presence than before; it hasn't shrunk so I can only assume it is because it is not eye level, in other words I'm looking down at it. 1. 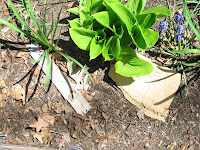 The label also has fallen into the garden and is hanging out with the wooden piece (photo). 1. The corrugated piece of board is totally gone and I think some of the organza also is gone. Let me be honest here. I hate compact fluorescent bulbs. Whenever I switch one on the room seems darker. BUT even more than that. I hate the color they give off. Why can't someone create a fluorescent bulb with good color? They Ask Where's Your Felt? 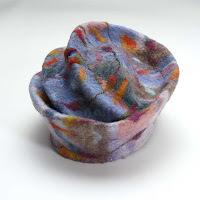 Friends have asked to see the felt pieces I've made and I'm putting some of them up. I may try to find a way to work with the encaustic and felt as they are so different in feel and attitude. It could be interesting to combine them. 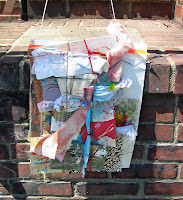 I began a second series of encaustic collages which I like and wanted to get them up. So here they are. The theme is Metamorphosis and I did these for a show I entered. The overarching theme is how an individual goes from zero to formed. Since it is a lengthy process, I'm thinking this is just the beginning of series. For these three pieces, I began with the imagery. I have old photograph albums, as well as drawings I made, and pages from medical books. I knew I wanted to use elements from each and began to look through everything, putting aside specific images I thought interesting. Encaustic medium allows the layers to become transparent which, I think, enhanced one image growing from another. 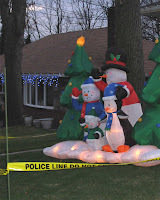 Christmas decorations are taken seriously where I live. But, I've never seen anything like this. I took this photo of a house around the corner from me with its ambivalent message about good will to all people. I reworked two of the pieces from my last post and entered them in a show, and I'm waiting to see if I made the first cut. It's a bit nerve wracking I must say. But what a nice birthday present if I do. These works are larger than ones I usually make. They're about 20"x 30". They are made on an off white massa (rice) paper, with a wax resist. After I applied the resist, I watered down some blue fabric dye and applied it with a foam brush and left it to dry. 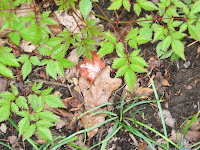 When it was dry, I ironed off the wax and drew into the irregular swirls it left. The negative space was strong and I reacted to it. 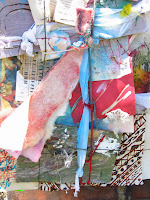 Artist - Encaustic, Felt, Digital Art and Manipulation, Mixed Media. Making money to support my artistic right brain side by being a fundraiser (right brain and left brain) with 25 years of experience raising money for national, progressive not-for-profits and one animal welfare center where I was lucky to adopt an 8-year-old apricot Standard Poodle named Asher. EVANS ENCAUSTICS - is the maker of fine artist grade encaustic paint and materials. E-mails and calls are welcome to discuss any aspect of encaustic painting.